Felt Films' upcoming series DARK/WEB has been a long time coming, but it may still be on the horizon yet. A new poster and very brief teaser has emerged prior to the show's public premier at aTVfest next week. Dark/Web is the brainchild of brothers Michael and Tim Nardelli, and Mario Miscione; creators of the cult hit Circle, which was purchased for distribution by Netflix in 2017. In the near future, the evolution of the internet has resulted in a world in crisis; one where everyone is connected and no one is safe. Cyber securities analyst Molly Solis understood these dangers better than anyone, and was determined to keep people protected — until she vanished without a trace. Now, friends and foes are in a race against time to decipher cryptic messages she's left behind that paint a grim picture of technology run amok. 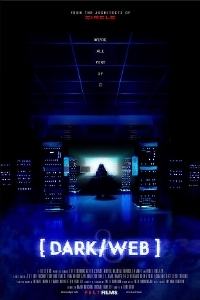 Dark/Web’s cast includes Gabriel Luna (Agents of Shield), Buffy the Vampire Slayer alum Nicholas Brendan and Clare Kramer, along with Hannah Marks (Dirk Gently’s Holistic Detective Agency), Cassi Thomson (Big Love), Zelda Williams, and Sully alums Molly Hagan and Graham Sibley. Brian Elerding (Mad Men) Brandon Scott, Siobhan Fallon Hogan (Wayward Pines), Michael Nardelli, and Shannon Collins (The Punisher: Dirty Laundry) also appear in the show.